Record Group 26: Records of the Department of State, Basic Documents, Indian Deeds, #35, "Deed of Nutimus, Teeshakommen, et. 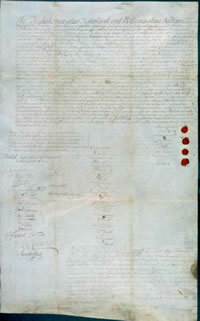 al....to John Thomas and Richard Penn" August 25, 1737. Iron gall ink on parchment, 28 3/8"X 17 5/8". Consistent with the Society of Friends' (Quakers) belief that all people are children of God and should be considered equals, William Penn attempted to treat Native Americans (Indians) fairly. Although King Charles II had granted to Penn in 1681 the land that he called "Pennsylvania," a vast expanse including an enormous unexplored wilderness, Penn himself took the further step of purchasing each portion within the grant from the Native American residents before selling subdivisions within it to his colonists. He made his first purchase in 1682 and continued this practice in the following years. Many were for small tracts, some overlapping the previously purchased tracts. William Penn's sons John, Richard and Thomas had inherited the colony's proprietorship, but had lived beyond their means and, like their father, had fallen into debt. In order to increase their income, they began selling land to European settlers before it had been purchased from the Indians. Provincial Secretary James Logan, the Proprietors' most important administrator, was also selling land that lay beyond the area purchased from the Indians. In fact, he was one of Pennsylvania's largest land speculators. The demand for land after Penn's death in 1718 had greatly increased because of heavy immigration from Europe, and settlers were moving north from southeastern Pennsylvania and west from New Jersey. In addition, German immigrants dissatisfied with the available land in New York settled on the upper Schuylkill River and further northeast into the Minisink lands, without permission from either the Indians or the Proprietors of Pennsylvania. Pennsylvania officials believed that they needed to extend their authority and provide the institutions of government in these new settlements. As a result, they considered it necessary to obtain a clear title from the Indians to the land in the upper Delaware and Lehigh River valleys. To demonstrate their claim to the area, they showed to leaders of the Delaware Indians living there a deed that they insisted proved William Penn had bought the land in 1686, adding that he had not paid for it because the land described in the deed had never been measured off to the satisfaction of both buyer and sellers. Because these Delaware Indians with whom Logan and the Penn brothers spoke had moved there from New Jersey, they knew nothing about the alleged 1686 purchase. They tried to secure help to resist the Proprietors' claims from the warlike Iroquois Confederation to whom they had long acknowledged they were subservient. 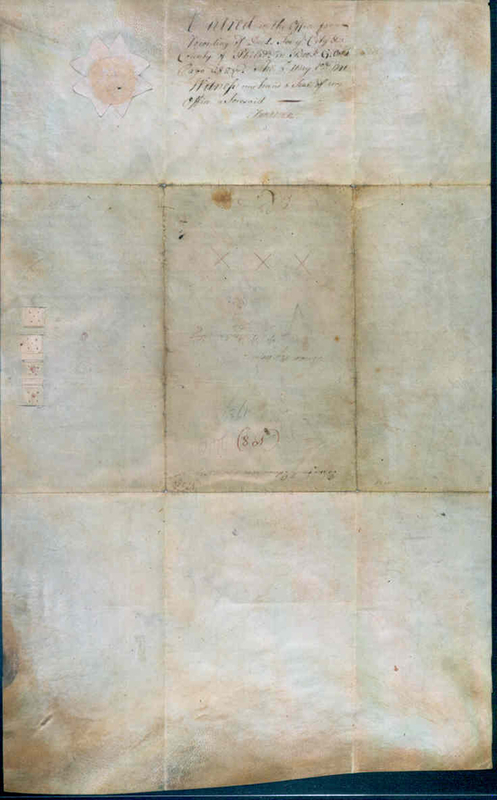 To prevent this and isolate the Delawares, Logan composed a deed that the Iroquois leaders signed giving up all Iroquois' interests in the area. Without support from the Iroquois the Delaware leaders felt overwhelmed, and they relinquished on August 25, 1737, the lands that the Penns and Logan wanted. The next step was to measure the purchase and specify its boundaries. The deed indicated that the purchase extended from a point on the Delaware River near present-day Wrightstown, northwest into the interior "as far as a Man could walk in a day and half," a typical Indian measurement of space. Logan hired three men to "walk off" the area, who were accompanied initially by several Indians. Two of the three hired "walkers" were unable to maintain the fast pace and dropped out. The third eventually collapsed in near exhaustion. The Delaware walkers early had withdrawn in disgust, complaining bitterly that the white men did not "walk fair." The "walk" ended well into the Lehigh River Valley, near what is now the Borough of Jim Thorpe (formerly Mauch Chunk) at the foothills of the Blue Mountain. Because the Penns had sent scouting parties to clear the route and had recruited outdoorsmen to travel it, the walk covered as much as twice the distance Indians normally traveled in a "day and half." Then, instead of projecting the boundary due east from the place where the "walk" had ended, Pennsylvania's surveyors drew the line at a right angle to the Upper Delaware River, near the New York border, giving the Proprietors far more land than the Delaware chiefs originally had in mind. The Delawares charged that the deal was a fraud. It is very likely that the reason for the Indians' ignorance of the 1686 sale is that it never happened. Logan could not produce an original copy of the deed, nor does the sale appear in Pennsylvania's provincial land records. Consequently, the outraged Delawares refused to leave the land, and the Pennsylvania officials called on the Iroquois to force them out. This they did in 1741, informing the Delawares that as a people who accepted rule by the Iroquois they had no right to sell land in the first place. The Iroquois rounded out their ultimatum with insults, calling the Delawares "women." The deed and "Walking Purchase" that implemented it were revealing. Certainly a person more skilled in the English language than any Native American of the time had prepared the document, but it included not only English legal terminology but also typical Native American phrases that showed respect for elders and their own primitive way of calculating distances. More important is what they disclose concerning the attitude of the Europeans-the Proprietors and their officials- toward the Indians. William Penn's sons John and Thomas, as well as James Logan indicated clearly that they had abandoned William Penn's policy of fairness toward Native Americans. They seemed to have had no qualms about using one group of Indians to cheat another out of its land. Their action also demonstrated their short-sightedness. Although they achieved their immediate objectives of acquiring land in the upper Delaware and Lehigh River valleys from the Indians, they contributed to a later catastrophe by alienating the Delawares. Forced from their homeland, all but a few moved west where the French welcomed them and promised them a chance for revenge. Not needing motivation but only the opportunity, as the French implemented their claims to the Allegheny and Ohio River valleys during the mid-1750s, the Delawares moved down the Susquehanna and ravaged Pennsylvania's frontier. They destroyed crops, burned barns and homes, carried off and killed many of the colonists. The Quaker Party in the provincial legislature charged, probably validly, that the Delawares' actions were the direct result of the "Walking Purchase." The Walking Purchase. 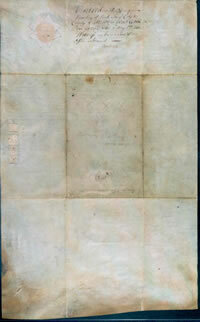 The following transcript is taken from the published Pennsylvania Archives, First Series, Vol. 1, pp. 541-543. We, Teesshakomen, alias Tisheekunk, and Tootamis alias Nutimus, two of the Sachem's or Chiefs of the Delaware Indians, having, almost three Years ago, at Durham, begun a treaty with our honourable Brethren John and Thomas Penn, and from thence another Meeting was appointed to be at Pensbury, the next Spring Following, to which We repaired with Lappawinzoe and Several others of the Delaware Indians, At which Treaty Several Deeds were produced and Shewed to us by our said Bretheren, concerning Several Tracts of Land which our Forefathers had, more than fifty Years ago, Bargained and Sold unto our good Friend and Brother William Penn, the Father of the said John and Thomas Penn, and in particular one Deed from Mayhkeerickkishsho, Sayhoppy and Taughhaughsey, the Chiefs or Kings of the Northern Indians on Delaware, who, for large Quantities of Goods delivered by the Agents of William Penn, to those Indian Chiefs, did Bargain and Sell unto the said William Penn, All those Tract or Tracts of Land lying and being in the Province of Pennsylvania, Beginning upon a line formerly laid out from a Corner Spruce Tree by the River Delaware, about Makeerickkitton, and from thence running along the ledge or foot of the Mountains, West North West to a corner white Oak marked with the Letter P, Standing by the Indian Path that Leadeth to an Indian town called Playwickey, and from thence extending Westward to Neshameney Creek, from which said line the said Tract or Tracts therebyi Granted, doth extend itself back into the Woods as far as a Man can goe in one day and a helf, and bounded on the Westerly side with the Creek called Neshameny, or the most Westerly branch thereof, So far as the said Branch doth extend, and from thence by line to the utmost extent of the said one day and a half's Journey, and from thence to the aforesaid River Delaware, and from thence down the Several Courses of the said River to the first mentioned Spruce tree. And all this did likewise appear to be true by William Biles and Joseph Wood, who upon their Affirmations, did solemnly declare that they well remembred the Treaty held between the Agents of William Penn and those Indians. But some of our Old Men being then Absent, We requested of our Brethren John Penn and Thomas Penn, that We might have more time to Consult with our People concerning the same, which request being granted us, We have, after more than two Years since the Treaty at Pensbury, now come to Philadelphia, together with our chief Sachems Monochyhickan, and several of our Old Men, and upon a further Treaty held upon the same Subject, We Do Acknowledge Ourselves and every of Us, to be fully satisfyed that the above described Tract or Tracts of Land were truly Granted and Sold by the said Mayhkeericckkishsho, Sayhoppy, and Taughhaughsey, unto the said William Penn and his heirs, And for a further Confirmation thereof, We, the said Monockyhickan, Lappawinzoe, Tisheekunk, and Nutimus, Do, for ourselves and all other the Delaware Indians, fully, clearly and Absolutely Remise, Release, and forever Quit claim unto the said John Penn, Thomas Penn, and Richard Penn, All our Right Title, Interest, and pretentions whatsoever of , in, or to the said Tract or Tracts of Land, and every Part and Parcel thereof, So that neither We, or any of us, or our Children, shall or may at any time hereafter, have Challenge, Claim, or Demand any Right, Title or Interest, or any pretentions whatsoever of, in, or to the said Tract or Tracts of Land, or any Part thereof, but of and from the same shall be excluded, and forever Debarred. And We do hereby further Agree, that the extent of the said Tract or Tracts of Land shall be forthwith Walked, Travelled, or gone over by proper Persons to be appointed for that Purpose, According to the direction of the aforesaid Deed. In Witness whereof, We have hereunto set our hands and Seals, at Philadelphia, the Twenty-fifth day of the Month called August, in the Year, According to the English account, one thousand Seven hundred and thirty-seven. 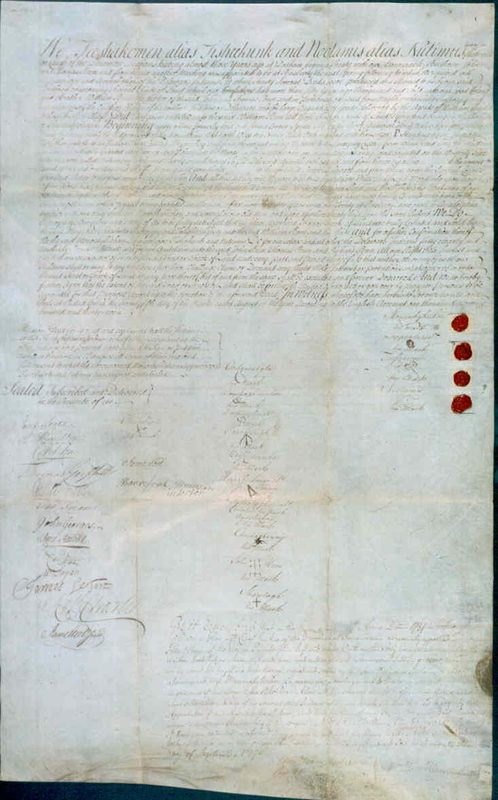 The above Deed being read and explained to all the Indians at this Treaty, the following Persons, on behalf of themselves and all the other Indians now present, have agreed to Sign or put their Names to the same as Witnesses, in Token of their free and full consent to what the above named Monochyhickan, Llappawinzoe, Tisheekunk, and Nutimus, have signed and Sealed.